linsminiartform: "New Baby Duty" baskets!! Sounds like you had a fantastic time AND managed to get work done. Good job. 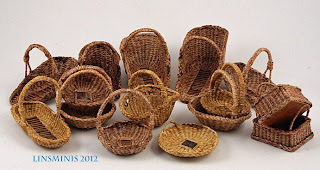 Lovely baskets! Son una verdadera maravilla, las hay de todas formas. They are really lovely! You have made them so perfectly and in so many diffetent shapes. Oh! How many things you have to do ... The baskets are beautiful! Cheers to you and your family. Happy Easter and kisses in your heart. The baskets are positively beautiful! Absolute perfection! Happy Easter to you and your family! You've been busy!! These baskets are lovely. Lidi..I've got a long way to go to match your fabulous baskets! You did a wonderful job, your baskets are really gorgeous.